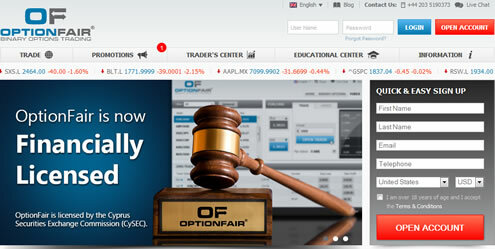 OptionFair is a binary options broker operated by B.O. Tradefinancials Ltd. in Cyprus. Impressively, the company is financially regulated. Their general business registration number is HE295102, and their financial license number as a company providing investment services is 216/13. This by itself is already something which sets OptionFair ahead of most of their competitors. Their transparency about their business information is very refreshing. A clear and detailed terms and conditions provides more information on how the company operates. To top it off, they offer an abundance of trading resources, flexible terms and conditions, a great website, and a demo account to new traders. •Trade as little as $25 or as much as $15,000. •Free demo account (limited to 72 hours). •USA traders are not permitted. •Match bonuses up to 100% on $15,000. Getting started on OptionFair is easy. Start by clicking on the bright red button in the upper right-hand corner which says “Open Account.” You will be asked for information about your name and country and contact information. You will then need to supply information about an account currency and a username and password. You can then choose to open a real account straight away, or open a demo account. As far as we can tell, the demo account only remains open for 72 hours, but you can probably get an extension by talking to an account manager. You do not need to speak to an account manager to open the demo account initially. Once you have input your information, you can get started using it right away. You also are granted five risk-free trades when you open your real account. One interesting thing about OptionFair is that when you go to deposit money in your account for the first time, the site asks you to fill out a questionnaire. You are asked about your trading experience, your income, your employment status, and your net worth. This survey seems to be present for regulatory reasons, but it also provides traders with a moment to self-evaluate. This seems a very considerate and levelheaded approach, and also far preferable to the usual hard-sell that we see with binary options brokers. OptionFair is interested in long-term clients, not newbie traders who are going to blow their accounts overnight with poor financial decisions. When you are ready to deposit, you can use a credit or debit card, wire transfer, or MoneyGram or Western Union. A number of e-wallets are also allowed, including Neteller, WebMoney, CashU, Qiwi, and Abaqoos. The minimum deposit is $250, or the equivalent in Euros, British Pounds, Yen, or Rubles. Five account tiers are available: Standard, Silver, Gold, Platinum, and VIP. The starting bonus is 30%, and the highest bonus is 100%. An extra bonus is available at the VIP level. A number of trading resources are available for free on OptionFair’s website, but at higher account tiers, you get access to more SMS alerts, trading strategies, free monthly withdrawals, financial expert sessions, and additional resources. There are no minimum thresholds for withdrawals on OptionFair. Information about additional promotions is available on the “Promotions” tab at the top of the page. Here you can learn more about referring a friend to OptionFair, risk-free trades, and special promotions that the site is offering like seasonal bonuses and opportunities. The “Trade” tab in the upper left corner will take you to the OptionFair trading platform. The platform is proprietary, so it may take a little time to get used to it, though you should find it easy and intuitive to navigate and use. Here, you can trade High/Low, One Touch, Boundary and Short-Term Options. Early close is available to manage your trades. It is wonderful that there are so many different ways to trade on OptionFair. Boundary trades in particular are great to see since not every broker offers these, and with boundary trading, you can potentially make money in flat markets. You can trade stocks, indices, currencies and commodities, and there are a large number of assets available on the site to trade. OptionFair provides an incredible range of educational resources to traders, including video tutorials, articles on trading, live webinars, and trade alerts. You will find these under “Educational Center” as well as “Trader’s Center.” At higher account tiers, you can spend time learning one-on-one with an expert and developing personalized trading strategies. All of these educational resources demonstrate good faith, as does the demo account and the risk-free trades. Customer service was not available when I checked in with live chat, but it was a holiday, so that was not unusual. There is a lot to be impressed about as you navigate OptionFair’s website. Information is easy to find, the company is transparent about its operations, and there are a ton of resources and features available to you to use. Under “Company Policy,” you will find detailed information about how OptionFair does business in compliance with Cyprus laws. On most binary options websites, you will see a short paragraph about how much the company values your business. This is substantial information, not an empty promise. Take a look at OptionFair’s platform and see what you think. Download some of their free resources to learn more about binary options trading. Get in contact with customer service and ask them whatever questions you have. Test out their customer service team directly, and if you are satisfied, it may well be worth your time to open up a demo account and give OptionFair a test drive.